BRAVO to the Jr. Board of the Whyte Ridge Community Center for holding a fundraising event this Sunday (March 24th). Bring your family and friends to this ‘Stained Glass Party’! 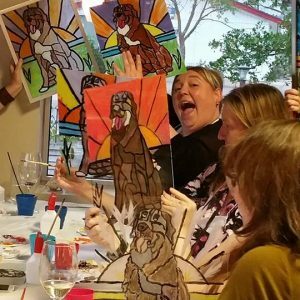 Have fun, learn something new, and go home with your very own 11″ x 14″ original faux stained glass piece of art. When you purchase your ticket you can choose from one of the design options. The hosts bring a variety of colors for so you can tailor your faux stained glass art-piece to your decor and style! Funds raised will support various events and activities at the Whyte Ridge Community Centre! We are very proud of our Jr. Board for planning and organizing this event and hope you can attend! The newly formed WRCC Jr. Board for the 2018/2019 year is run by area residents/students from both Henry G. Izatt Middle school and Vincent Massey High School. The Jr. Board was formed in order to reach a young population of community members to engage them in the Board development process, build future leaders and support various events/activities of WRCC.